It is a promising sign when a walk begins with an “I think we’ve died and gone to heaven!” moment. Especially when things haven’t actually gone according to plan. 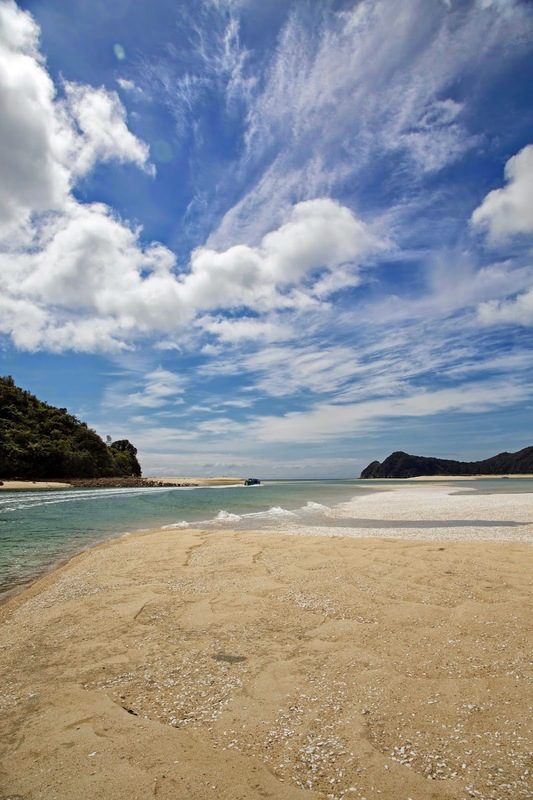 We were supposed to start our walk on New Zealand’s Abel Tasman Coast Track at an inlet called Totaranui. But we soon learned that in these parts you have to take seriously the saying “time and tide wait for no man”. 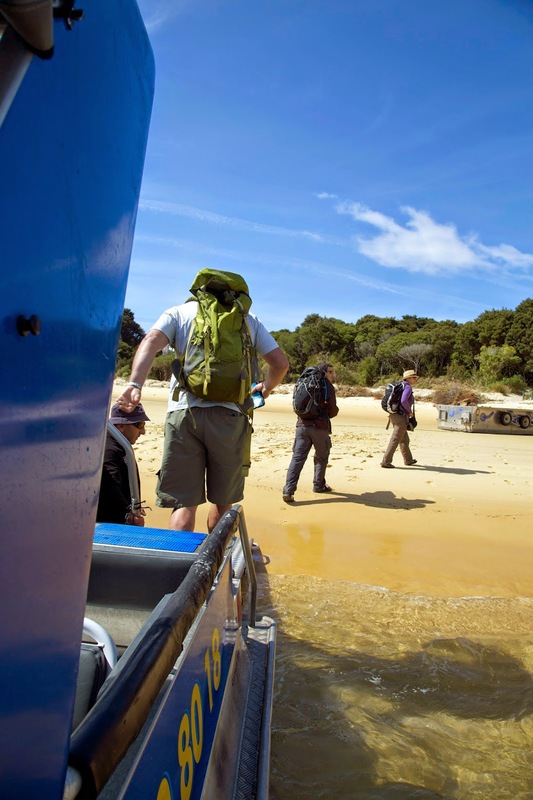 Just before boarding our water taxi at Marahau in the south of the Abel Tasman National Park, for our trip to Totaranui in the north, we learned a crucial piece of information about tides. To walk from Totaranui south to Awaroa, you need to cross the Awaroa Inlet. We knew that. 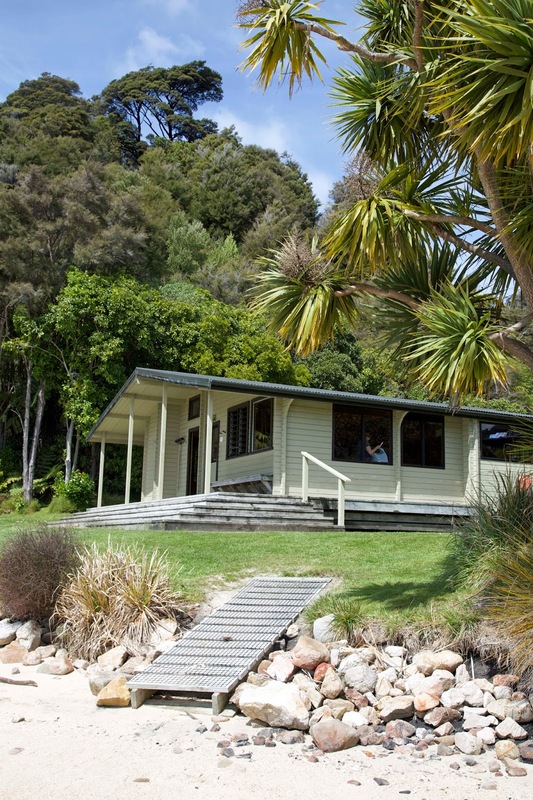 The hut is on the southern side of the inlet, and you can only cross it two hours either side of low tide. We knew that too. What we hadn’t pieced together was how the actual tide times for that day would affect our potential crossing times. That particular conjunction of time and tide meant a crossing at 10 o’clock in the evening. That was an option we quickly ruled out. But our water taxi skipper had a typically breezy Kiwi solution. He would show us Totaranui – allowing us a 10 minute stop and look around – before taking us back to the southern side of Awaroa Inlet. And that’s where, as the burr of the boat’s engine receded and we looked around, we started to think of heaven. Instead of a long afternoon’s walk and a dangerous swim/wade, we had the rest of the day to settle into both the hut and the tranquility. We had read that Awaroa was one of the few places on this bit of coast on which Maori people had a permanent pre-European settlement. 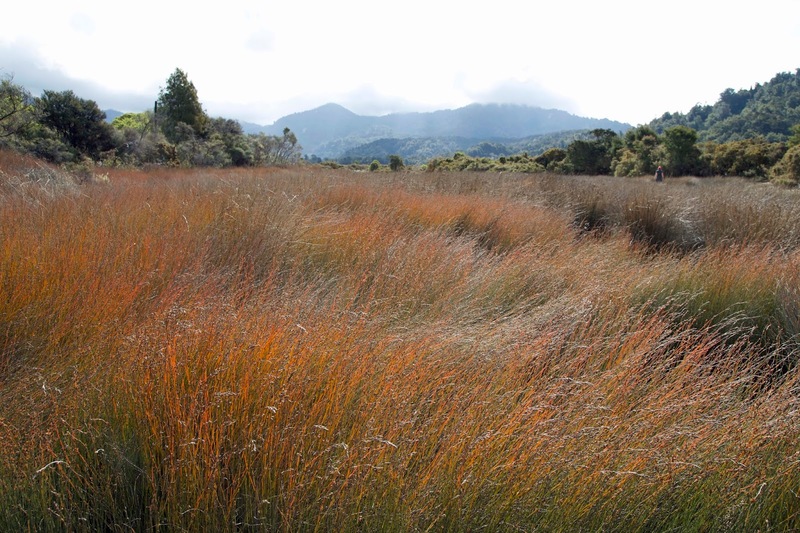 Around the well-watered flats they could plant crops of kumara to supplement the rich marine and forest resources of the area. Dutch explorer Abel Tasman landed near here in 1642, shortly after his “discovery” of the island he named Van Diemen’s Land. Eventually both that Australian island (in 1856) and this national park (in 1942) would bear his name, as would the sea between Australia and New Zealand. We were joined in the hut by three young trampers from Christchurch, all I.T. workers taking a few days off to recharge their batteries. The DoC hut ranger was the only other person we saw at the hut. This was a little unexpected, given that this is supposed to be New Zealand’s most popular “Great Walk”. Perhaps mid-October was early in the season; or did the locals know something in the weather forecast that we didn’t? From the hut ranger we learned that there was a lodge about 40 minutes walk away, and that you could buy "proper" coffee and even a meal there. 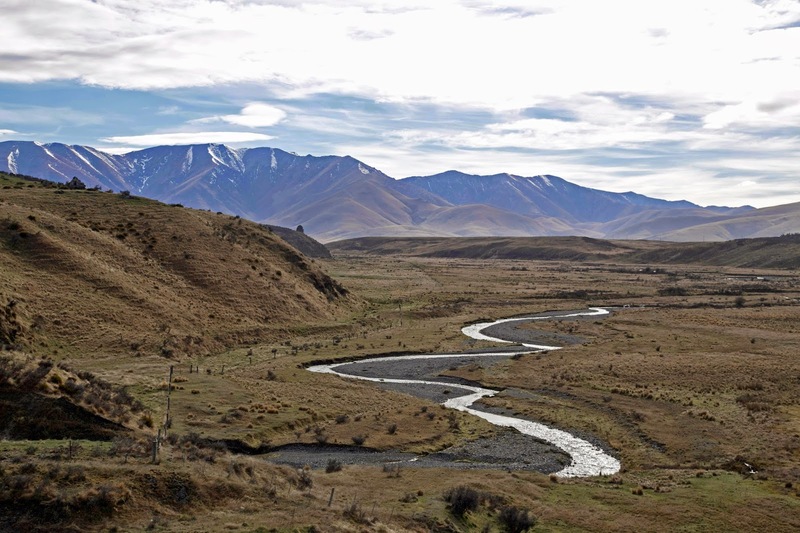 We long ago learned not to be surprised by what’s on offer on New Zealand walks. And not being at all averse to luxuries on a walk, we decided to see for ourselves. After maybe 15 or 20 minutes we came to a building with a couple of ambiguous signs, none of which indicated it was the lodge. It certainly didn’t look open for business, but I wandered up for a look anyway. As I peered in a window, a man came out to chat. He was an electrical contractor doing a bit of work. He assured me that it was the lodge, but that no-one was around. There wouldn’t be any coffee, at least not from that source. Too early in the season again, perhaps? 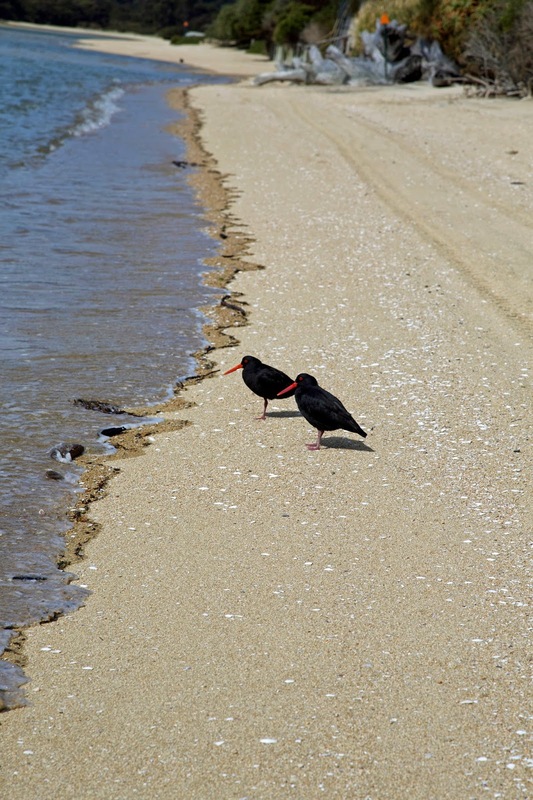 We explored the picturesque inlet for a while, taking time to watch a pair of variable oystercatchers (Haematopus unicolor) as they strutted in unison along the strand. Their Maori name is torea-pango, and they're also known in New Zealand as red bills. We found them remarkably like Australia’s sooty oystercatchers, except for the variability in their plumage (which isn't always black) and their pink rather than red legs. Also our “sooties" frequent rocky shores, whereas these appeared happy on sandy shores. While it wasn’t anything like a long walk with a full pack, our small expedition in the tangy sea air was enough to work up an appetite. Back at the hut we broke out the cheese, biscuits and wine (refer to my mention of “luxuries” above), before getting on with dinner (only a freeze-dried, I'm afraid, but washed down with a little more wine). Our Christchurch hut mates had gone off to make a fire pit on the beach, but with clouds threatening and the wind getting up, we decided against joining them. Frankly, whether we'd earned it or not, we were more than happy to head for our bunks for an early night. Need I say it’s not about the bike? A bike is a means of conveyance, albeit a particularly convivial one for open air travel. But nor is it all about the trail. That is just a path along which to travel; a ribbon draped – cunningly at times – across a landscape. Yet to say it’s about the landscape is simplistic too; misleading even. 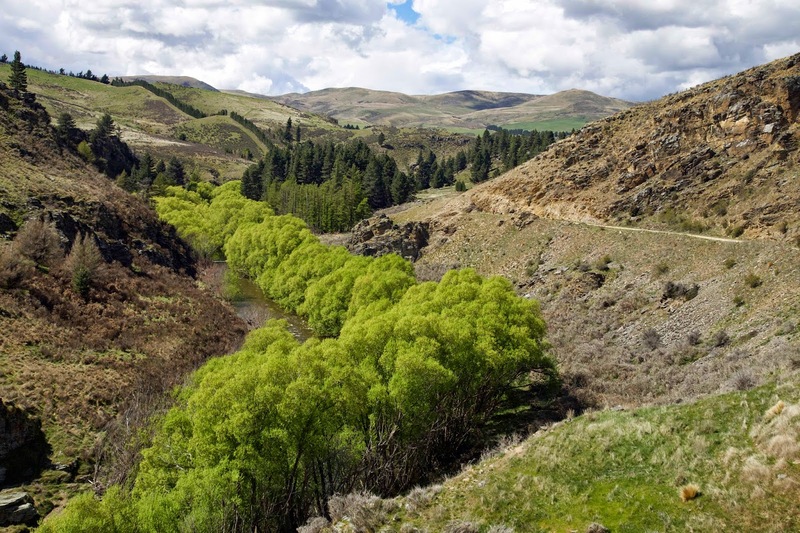 Central Otago’s landscape is vast and powerful, filled with such grand wonders as snowy mountains and sinuous, willow-fringed rivers. At the same time it also manages to be intimate, with all those tiny tail-wiggling lambs, for instance. 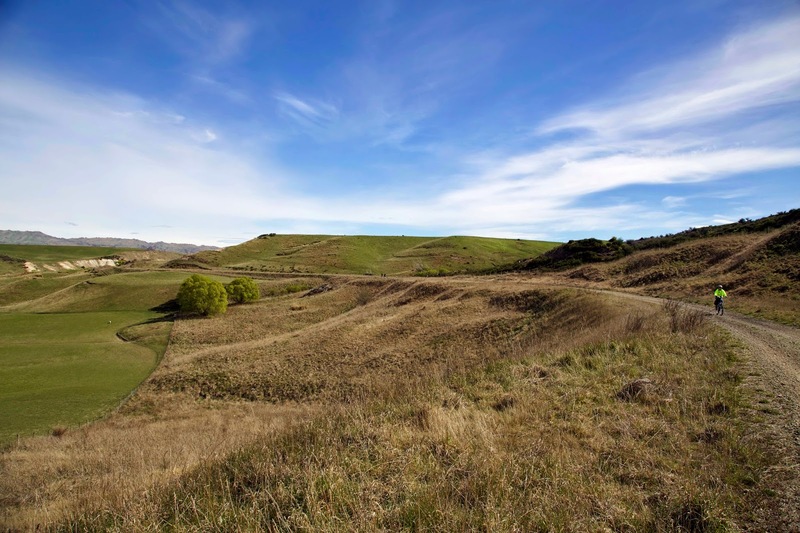 They’re a hint that Otago is rich with the stories of human endeavour and what people have done and continue to do within the landscape. It's the sum of all these that somehow invites you in; makes you want to look more closely. So at the end of each day’s ride – and let’s be honest, most were only half day rides – we always found something more to see; to do; to uncover. In fact on day one, even before we set bottom on bike, the tone was set by the breakfast stories of our host, John, at Dunstan House in Clyde. As we sat there in our strangely coloured cycling gear, feeling anxious and ill at ease about the challenges ahead, his stories made us feel kin to an array of weird and wonderful characters who had spent time in these parts. Many of the stories we heard and saw would have gold at their heart. An example came after day one’s ride. 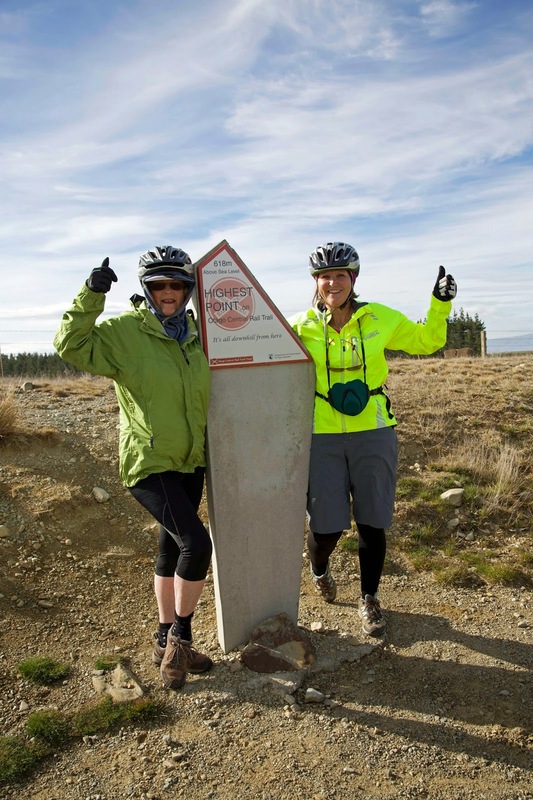 Downing our bikes at Omakau, we set off to explore Ophir, an extraordinarily intact former gold mining town. Its buildings and bridge were indicative of those richer origins. Its ossification was due to the demise of gold, as well as it being by-passed by the railway in 1904. That side-lined status might have been reinforced by it also being by-passed by the rail trail. But all that neglect has had a benign effect. Few 150 year-old towns are as well-preserved as Ophir, and now it’s an attraction in its own right. 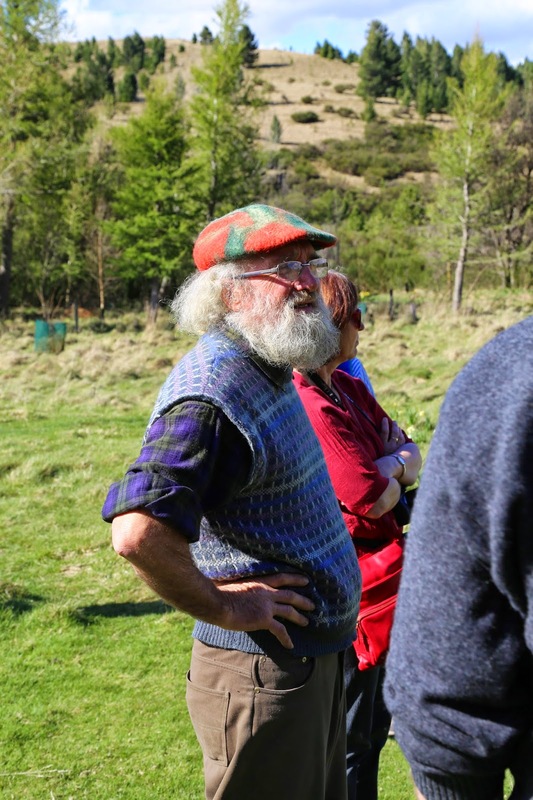 At Oturehua, the end of our second day’s ride, we were met by Sam, a local farmer turned guide. He took us in his people mover to more side-stories with a gilt edge. 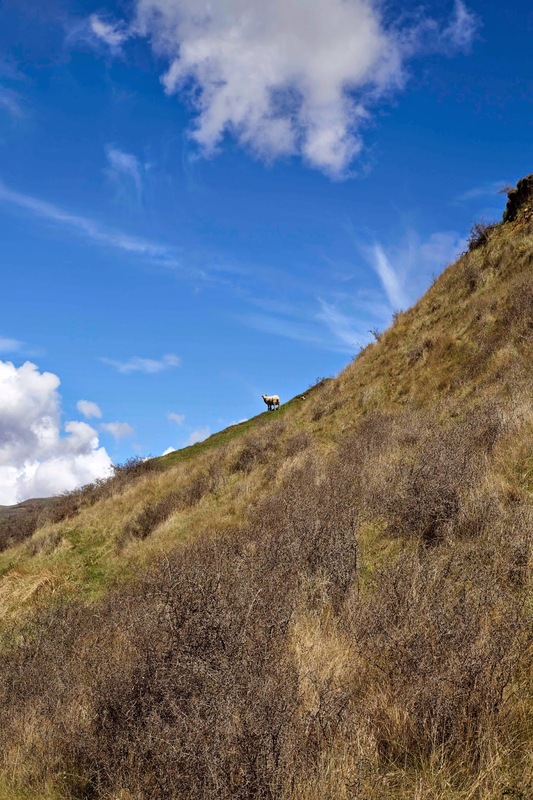 St Bathans and Cambrian were both founded during the gold rush of the 1860s. 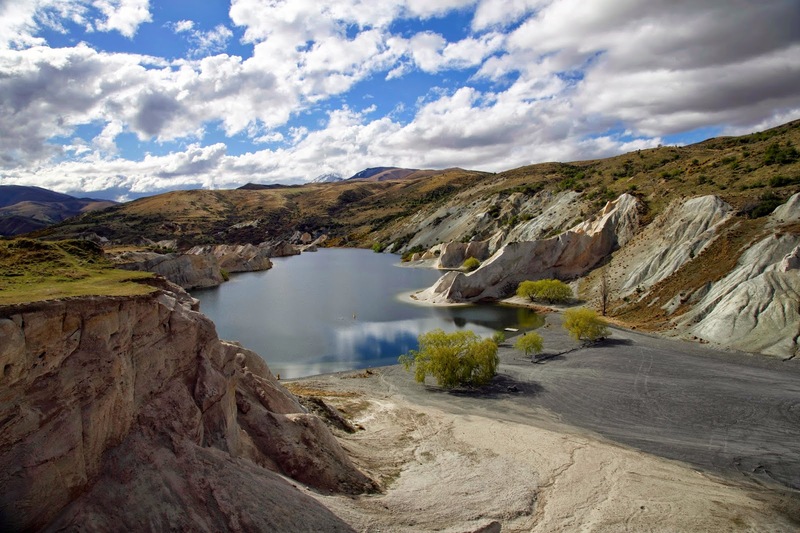 In St Bathans the evidence of that could clearly seen in the Blue Lake, a vast hole created by gold diggers and now filled with water. We paused for a drink at another watering hole, the marvellous Vulcan Hotel: a pub that could tell a few tales. The history at Cambrian, a little further down the already seldom-trod path, was partly delivered first-hand, when Sam introduced us to Bob. This lucid and pleasantly eccentric character was very keen to show our party his domain, which includes the Cambrian Common Forest. 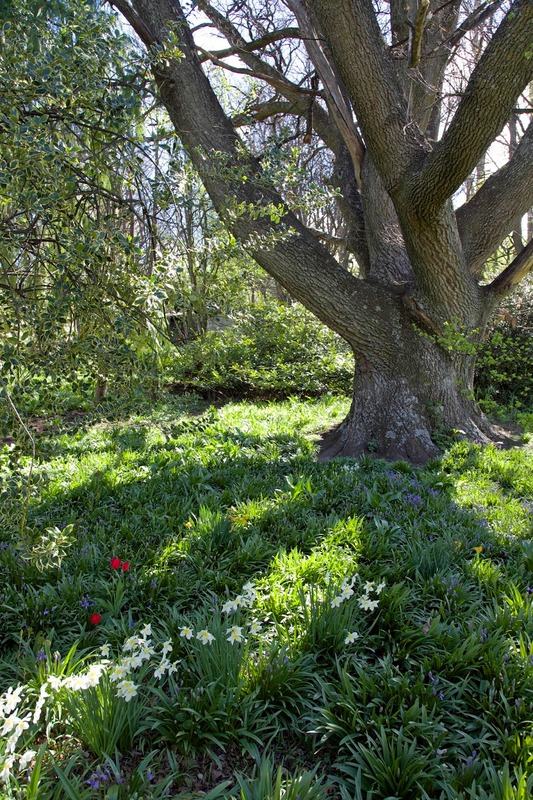 Bob began planting a forest/garden there in the year 2000, and already its thousands of trees and other plants have become hugely impressive. The town’s larger past – there are now only a dozen or less residents – was evident in the old school house and the remains of many other buildings. Our own eccentricities were challenged at the end of the next day, when we were taken from Ranfurly to Naseby for an afternoon of curling. I confessed to my brother that this ancient Scottish game, a kind of lawn bowls on ice, sounded as appealing to me as synchronised swimming. An hour later I was totally repentant, and by the end of our session I was begging for more time to perfect my technique. I’ll spare you the details of what’s involved in the game, but suffice to say it is a “must do” if ever you get the chance. I’ll add just one note, and that is that the game is competitive, and that sibling rivalry lives on in my family! Fortunately we contrived an honourable draw, rescuing dinner that night from any incivility. 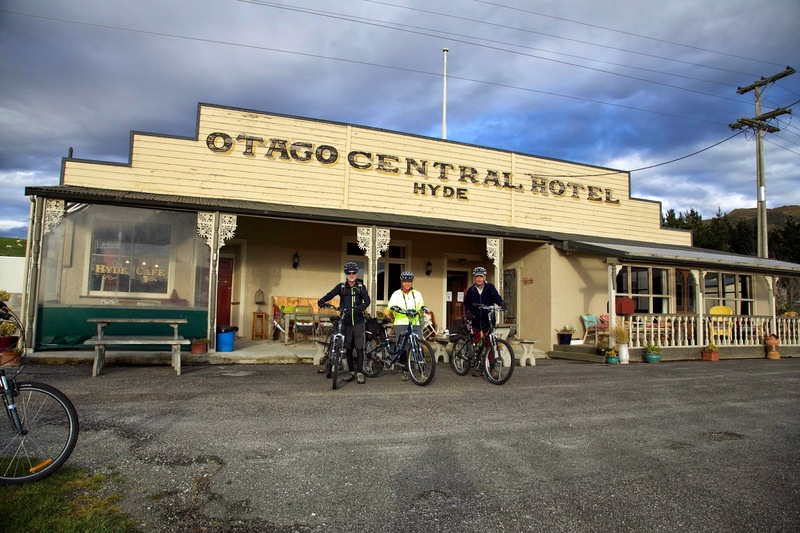 Our final night, at the Otago Central Hotel in Hyde, proved another highlight. Our host Ngaire not only cooked a three course meal for us, but gave us a spirited recital of her party piece, a poem called The Rail Trail Tale. Without giving too much away, I can tell you it involved cyclists, a car key and a long drop toilet. At the end of four days riding, and on a day which saw our support car break down, I can report that laughter was a good medicine. 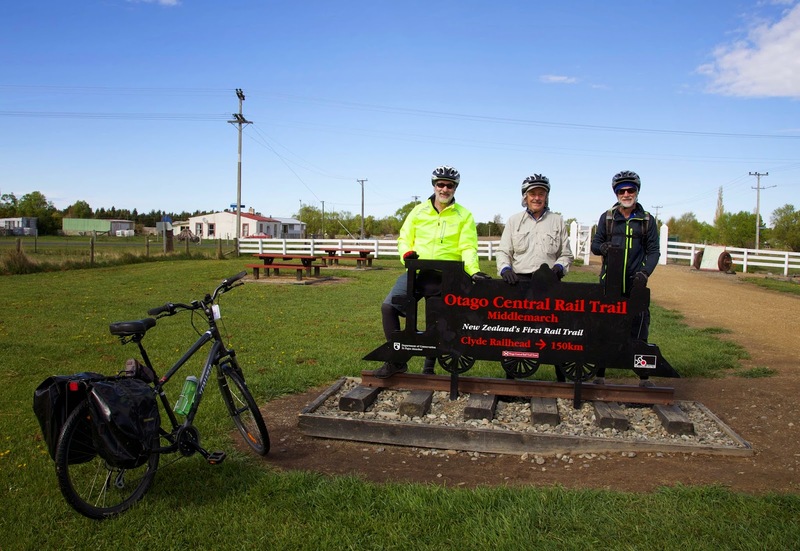 At first it may seem odd to end a post called “Off the Rails” by boarding a train, but our final act on the Otago Central Rail Trail was to join the Taieri Gorge Railway at Middlemarch. And rather than odd, it seemed fitting to travel via the mode of transport that led to this trail ever happening in the first place. 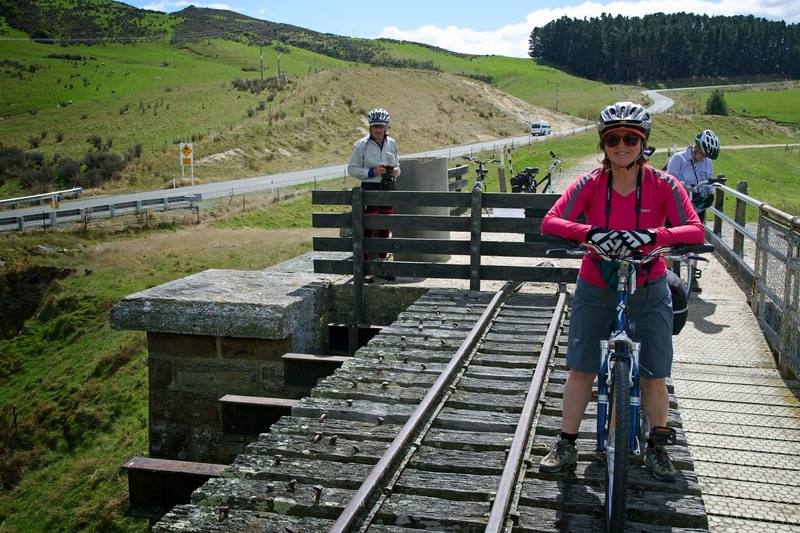 If we ogled at the view partly from a cyclist’s viewpoint, dreaming of how spectacular it would be to ride that final section down to Dunedin, we were more than happy to be travelling under someone else’s steam. Breakfast on our final day. It’s early, and we’ve not slept well. We wander in like Brown’s cows, each grazing at different times from the good spread laid out for us. But we do have one thing in common: we’re all anxious to know if the support car will start. 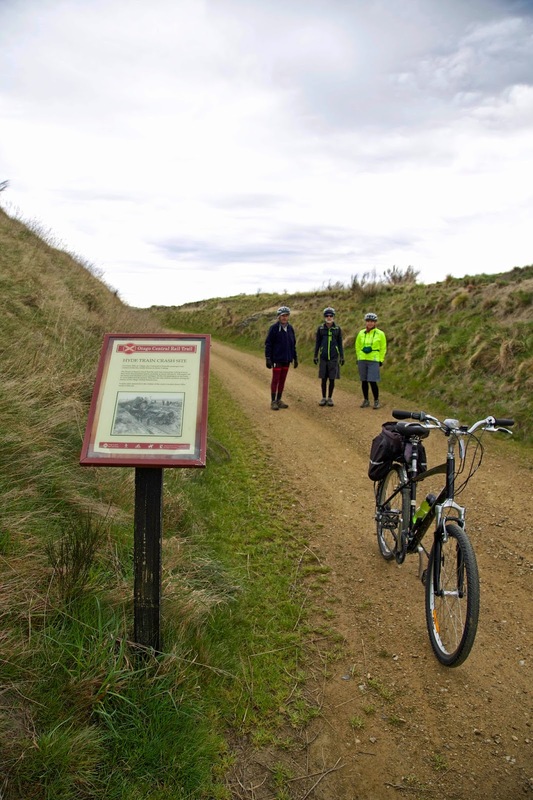 The plan is for my sister and sister-in-law to leave early, drive to Dunedin, then catch the Taieri Gorge train back up to meet us at Middlemarch; the end of our trail. The timing is tight, hence our anxiety about the car. If our ploy is to start the car using fuss and worry, it works. Without any hesitation the little beast sputters into life, and we wave Jude and Di off on their windy way to Dunedin. The rest of us then relax a little, taking our time to fit in a little more breakfast, before packing our gear and settling up with the host. Then it’s one final time into the saddle for the 27km ride to Middlemarch. According to some it will be one of the less interesting day’s ride. For us it’s one to savour, so we take our time at the start of the gradual downhill run. Before the landscape opens out onto the Strath Taieri valley, we have some hills to wind through. Just out of Hyde the Rock and Pillar Range, which will accompany us all day, bends close by the trail. Largely treeless and studded with quartz-rich schist tors, this characterful range was a skifield for Dunedin in cooler times. Latterly it has been part of “Middle Earth”, being used in various scenes in Peter Jackson’s fantasy films. The land closer to the trail holds other stories, and today we want to mark the site of one particularly sad tale. It takes place in 1943. 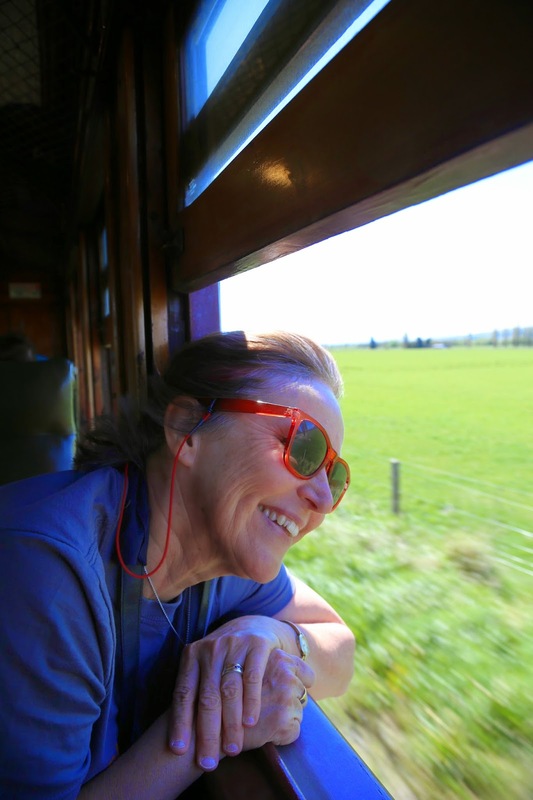 While World War Two drags on, a crowded passenger train is bringing 113 passengers from Cromwell to Dunedin on the Otago Central line. It enters these hills at a reckless speed, and in a tight cutting it derails disastrously. 21 people die and 46 others are injured. We find the exact spot, which is marked by an interpretation panel, and pause to reflect on this terrible event. For the locals the disaster was made worse by the fact that the government seemed to quickly forget the event. Perhaps its own decisions, which led to staff shortages and overwork on the railways, in turn contributed to the crash. Whatever the reason, it wasn’t until 1991 that a public memorial to those who died was erected at a roadside reserve near the crash site. We clamber over a stile to look at the pyramidal memorial, which includes a plaque with the names of the dead. The weather has been overcast, and a dark cloud hangs above us. To our right the Rock and Pillar Range takes on the look of an elevated graveyard. As we push on the weather improves and the range starts to hang back a little, now taking on a bluer, more benign appearance. 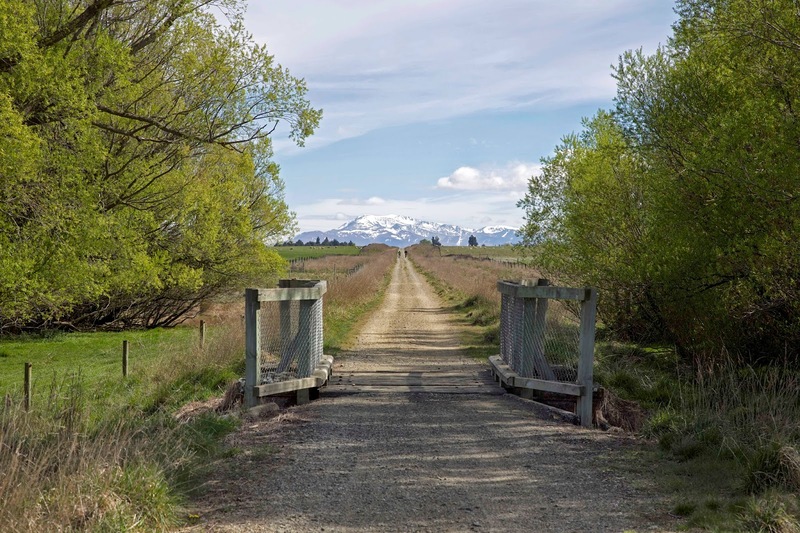 Just after the tiny station of Rock and Pillar, the trail flattens out and makes a straight run – the longest of the whole trip - towards Middlemarch. We’ve never been good at predicting the exact line of the trail. Time and again we’ve been surprised, astounded even, by the skill of the rail engineers in picking a line through this rumpled terrain. But here there is no skill needed. 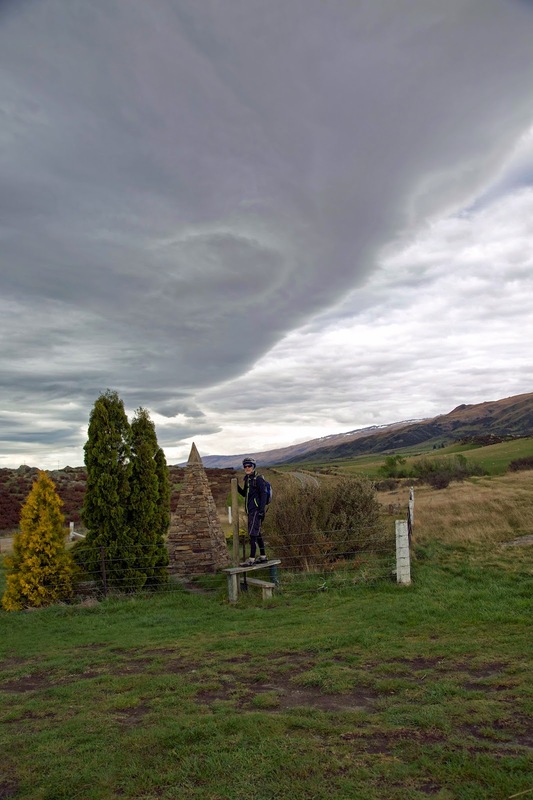 A bullet straight line takes us the final 6.3km into the small town of Middlemarch. 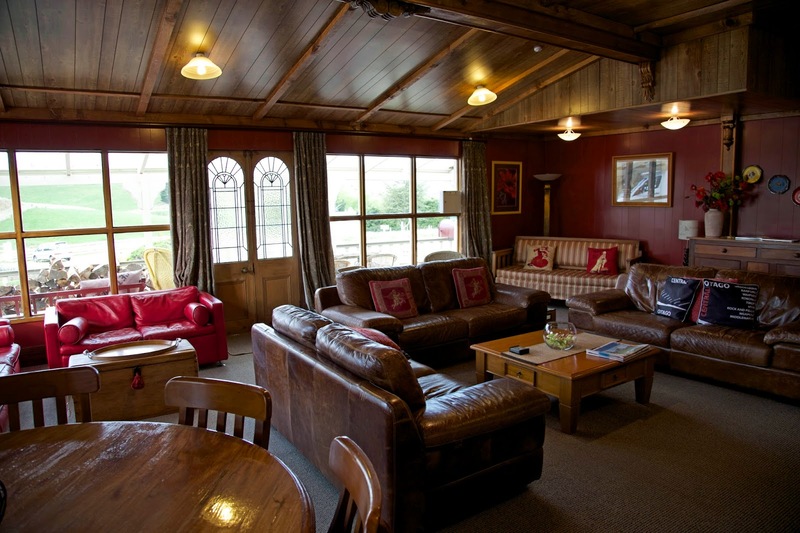 In planning our day we’d hoped for a cool, overcast morning, but with sun and blue sky to welcome us into Middlemarch. That’s exactly how it pans out, so much so that we’re more than warm by the time we reach the trail end marker. But Lynne and I remember the delights of the Kissing Gate Café from previous visits. With an hour before the Taieri Gorge train is due, we indulge in both cool drinks and deep coffees in the shady grounds of the café. We stretch, chat, smile and relax, then make our way back to the train station. Our full celebration begins when the “support crew” arrives on the train. In a buoyant mood we return our bikes and collect our gear from shebikeshebikes, the fantastic folk we booked our trip through. Then there’s just time to down our lunch before all six of us hop aboard the Taieri Gorge Railway for the trip into Dunedin. That’s where the idea for our trip had its genesis 8 years ago, so it’s apt that we should end our journey in that lovely southern city. 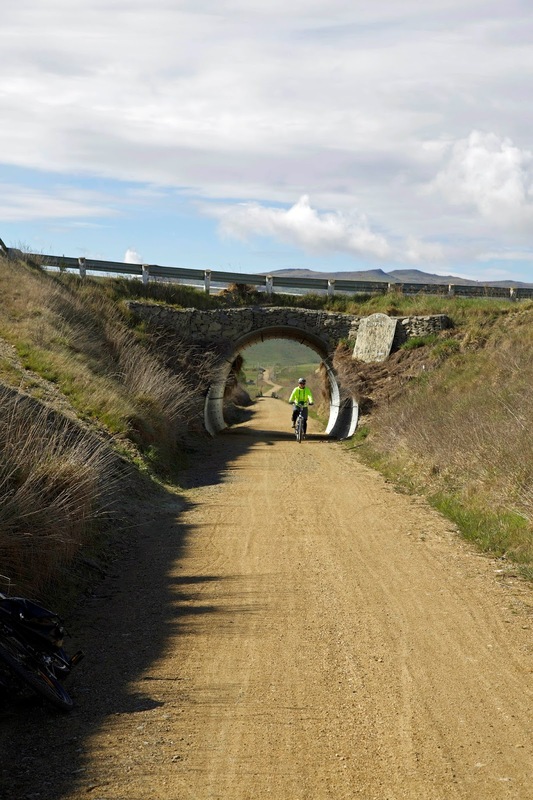 If we needed reminding that we were riding where only trains had been for most of the 20th century, Ranfurly Railway Station was enough to do it. The large, verandahed station is something of a hub for the town. As well as functioning as an iSite, it also houses a rail museum. All it lacks is trains to fill the generous space beside the platform. Instead its freshly painted exteriors and well-kept lawns function as an over-grand starting point for the handful of cyclists gathered there that morning. But we were getting used to the grand and generous spirit of the people along the rail trail. After we’d retrieved our bikes, bought lunch and topped up on coffee (no cafes on the trail this morning!) it wouldn’t have surprised us to have been officially flagged off by the locals. Instead we simply straddled our bikes and rode gently downhill into the pretty countryside. Given this was to be one our longer days – still only 32km – it was a good way to start. For me that idyll was rudely interrupted by a brash Aussie, who deliberately crashed into me just as we were approaching Waipiata. A sudden bash on my helmet had me spinning around in time to see a black and white blur rushing off towards a nearby tree. Yes, a magpie, a bird introduced to New Zealand from Australia in the 1860s, had taken offence at my intrusion into its nesting area. Unlike that more infamous Aussie introduction, the brushtail possum, this feral is a little more welcomed by New Zealanders. The magpie’s beautiful warbling call has even been celebrated in a well-known New Zealand poem by Denis Glover. An excerpt from “The Magpies” gives some of the flavour. Still, despite poetic celebrations, and my own previous experience with dive-bombing magpies, the blow to my helmet left me with a headache. I could only imagine the shape I’d have been in if I’d been bare-headed. We waited at Waipiata for the others to catch up – keeping a wary eye out for the aggressive Aussie – then cycled off towards our lunch rendezvous with the “support team” at Daisybank. First we had to ride through some sweeping green countryside, with a grand backdrop of the snow-flecked Kakanui Mountains, around Kokonga. Its forlorn former railway station contrasted with the district’s rich irrigated fields and sheep-filled hills. Arriving at Daisybank we were met by my sister, who looked and sounded as downbeat as Kokonga township. Apparently the car wouldn’t start. Those with a little mechanical nous – and then me – went over to the stricken car. None of us could get any sign of life out of it, and worse, we discovered we were in a mobile phone dead-spot. Fortunately a local farmer stopped and helped us jump-start the car. Jude then drove off to find an Automobile Association garage in Ranfurly, with the hope of getting fixed whatever was malfunctioning. The rest of us, now quite subdued, ate a quick lunch and rode on towards Hyde. We hoped we’d meet Jude there with a functioning car and a smile on her face. 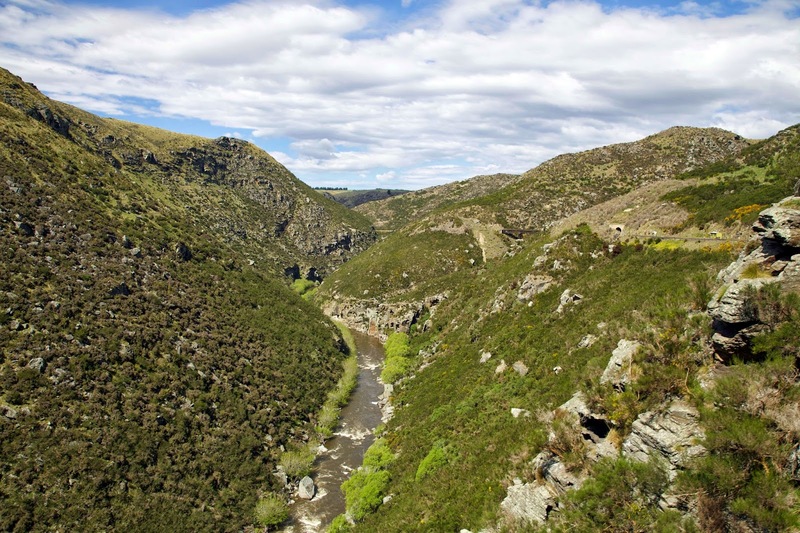 By now we were frequently seeing the Taieri River, which flows beyond the trail’s end and all the way into Dunedin’s outskirts. Seeing it burbling away below our track gave us a sense of going with the flow, and lifted our mood, even if parts of the track bucked the downhill trend and the wind began to blow against us. Over a viaduct, up a hill, through a tunnel, and around a few bends and we were at our destination of Hyde. After we’d downed a welcome drink at Hyde’s Otago Central Hotel, my sister arrived in the hire car. Functioning car: tick. However she wasn’t smiling. The mechanics hadn’t been able to find anything wrong with the battery, the starter motor, or any of the other likely suspects. But the car had kept going, as we could only hope it would next morning, when it would be needed early. Meanwhile there was some serious down-time to be had in the good old-fashioned comfort of the hotel. Tomorrow would have to take care of itself. It’s as well we feel at home in the saddle by Day 3, because today we climb to the highest point on the trail. 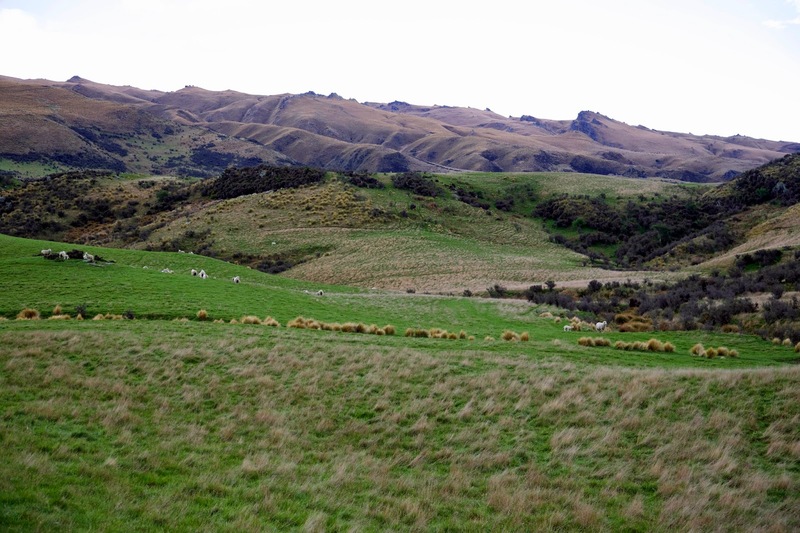 Our starting point’s elevation at Oturehua is 500m. Within 7km we must reach 618m. While that’s nothing dramatic, there’s still work to be done. Happily the fair weather and scenic distractions lift our spirits and boost our legs, and we’re soon cresting Seagull Hill. On the way we have crossed the 45th parallel twice, riding first north-east then turning south. We’re halfway between the equator and the South Pole; and nearly halfway along the OCRT. 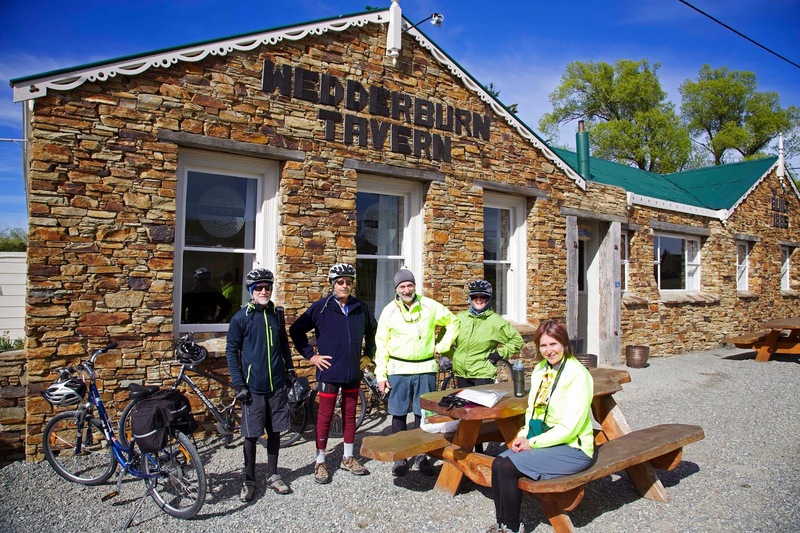 We can celebrate that at Wedderburn, and cruise down the hill to the Wedderburn Tavern where we plan to keep up our morning coffee tradition. We meet our “support team” there, and she has to break the bad news to us. The Tavern is closed. There’s a laconic note informing us that they normally open at 10am; or perhaps 11am; or maybe a little later. As there’s no sign of life, we use their outside table for a frugal water and chocolate break. 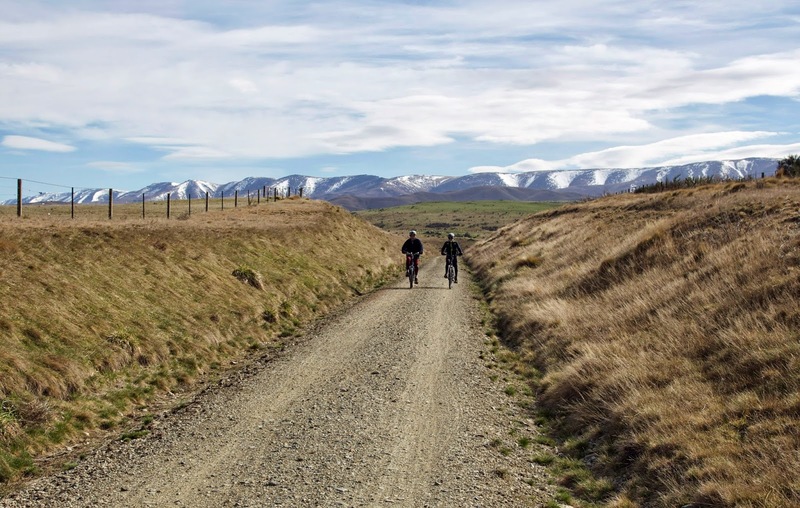 Then it’s back in the saddle for the long stretch across the Maniototo Plain. Yes, this country doesn’t get much broader than the Maniototo. It can even lay claim to a semi-continental climate, with extremes of hot and cold; drought and flood. As we ride through, we seem to only inch our way across the plain. Yet there is never a dull moment. 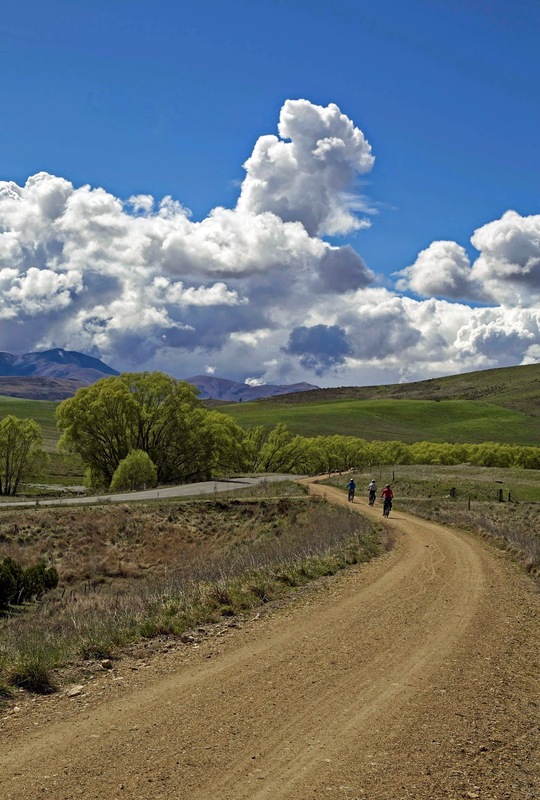 Again Brian Turner captures beautifully the nuances of cycling here in his poem “Cycling in the Maniototo”. While it’s a plain, there are always mountain ranges in view. Majestic Mount St Bathans is behind us, the Ida and Kakanui Ranges to our left, and Rough Ridge to our right. Ahead there are even hints of the Rock and Pillar Range, which will dominate the sky by the end of the trail at Middlemarch.